Ok so let me start by saying I am in love with this dresser. I found this at a local thrift store and there was no way I was leaving without it. I had pictured something this style for our dining room buffet. 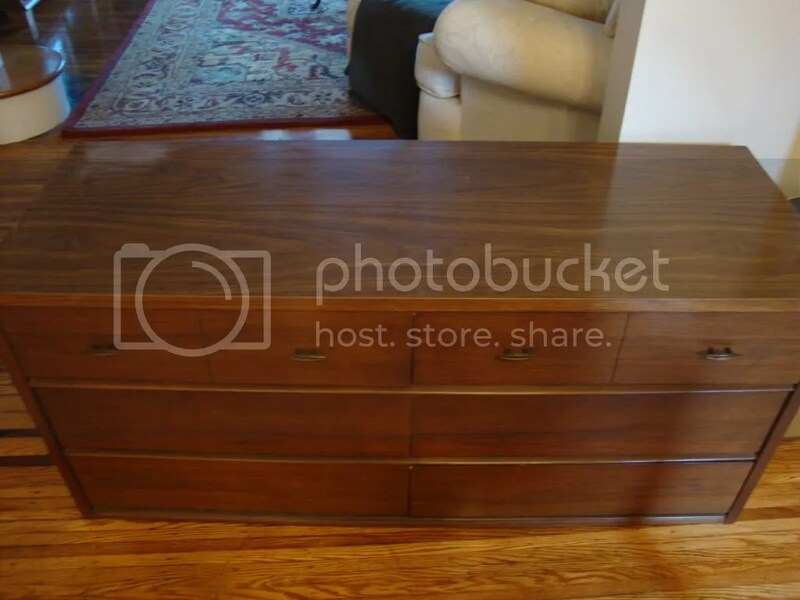 I’ve been really drawn to this style of furniture that ‘floats’ off the ground. In a house our size I think it helps to keep furniture from ‘sitting’ on the floor so it doesn’t start to look heavy or cramped. Interestingly enough I really liked the finish. If it were for our dining room which is painted a pale beige (shelter cove: behr) I might have considered leaving it as is. However I planned on putting it in our back bedroom which is already painted a dark brown (morrocan brown: sherwin williams). After some thought I knew what I wanted to do, but like most everything I do it wasn’t going to be easy! I pictured an almond color with pale greyish blue zebra stripes. Hmm now how was I going to do that? I checked online and Michaels for zebra stencils until I decided to create the stripes by hand. I drew the pattern on sticker paper that I found at Staples . When I realized how time intensive this project was going to be I decided to only do the top in zebra print. The first step was to remove all the hardware, legs and sand the entire dresser. 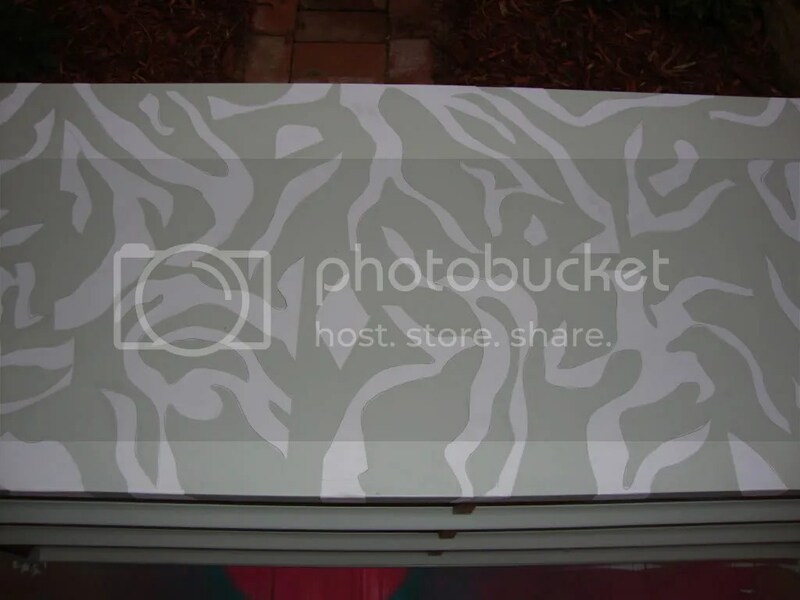 Then I painted it my base color (Rhino: Behr). I did about three coats, let it dry completely and then started on the top. 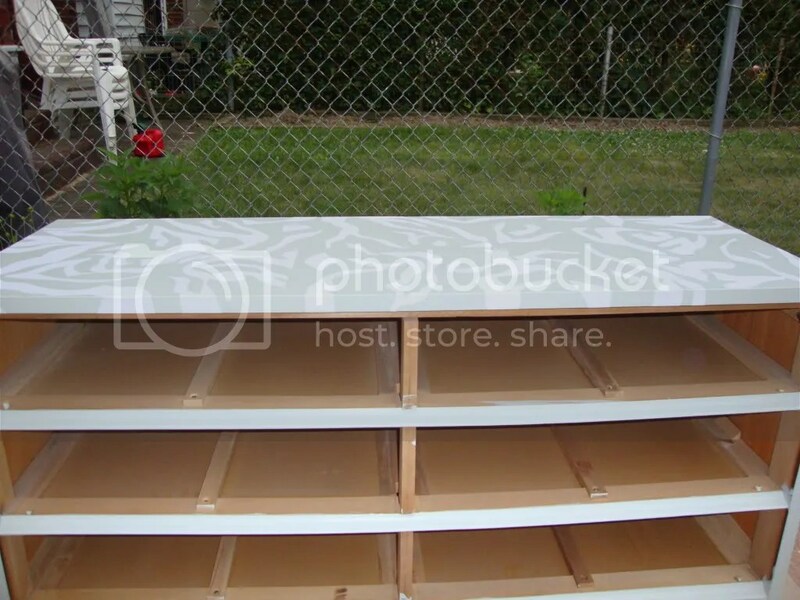 In order to do the top I had to cover the rest of the dresser in plastic to avoid over spray. I peeled off all the pre drawn stickers, stuck them to the top and sprayed the top in a high gloss almond spray. I also sprayed the legs and hardware a matching metalic silver. To finish it all off and make sure it was sealed I added a min wax poly seal. This looks so much better in our guest bedroom than our old furniture! 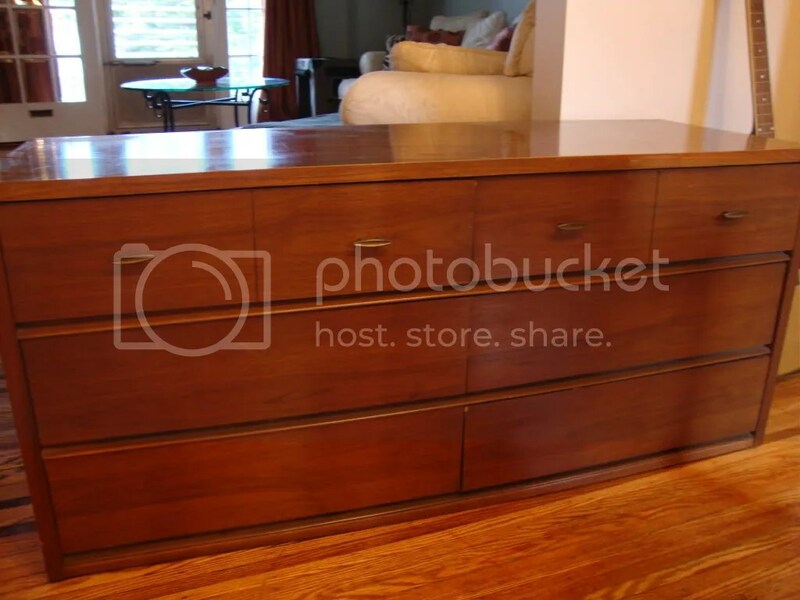 I love this dresser because of it’s youthful retro 60’s feel. What do you think? Have a project you need help with email amanda@sunflowercreationsonline.com I’d love to help! Your are quite talented. This dresser rocks! Don’t you just love thrifting!!!! Love, love, love what you did to this classic dresser. I too love this style of decorating. Maybe because it is so familiar to me having grown up in the 60’s. Great job from one designer to another. i freakin love that! 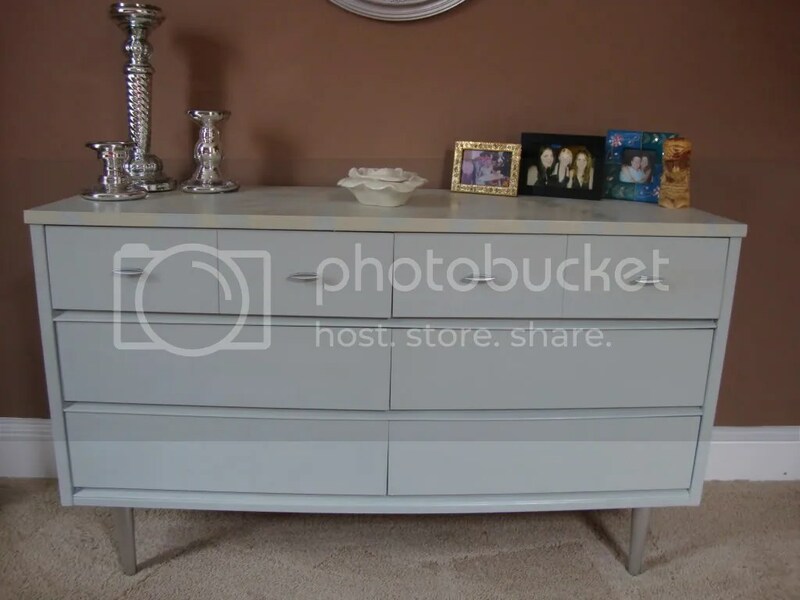 you will have to come to pittsburgh when i move and help me shift through the thrift shops for stuff that we can revamp like this dresser! I love it! 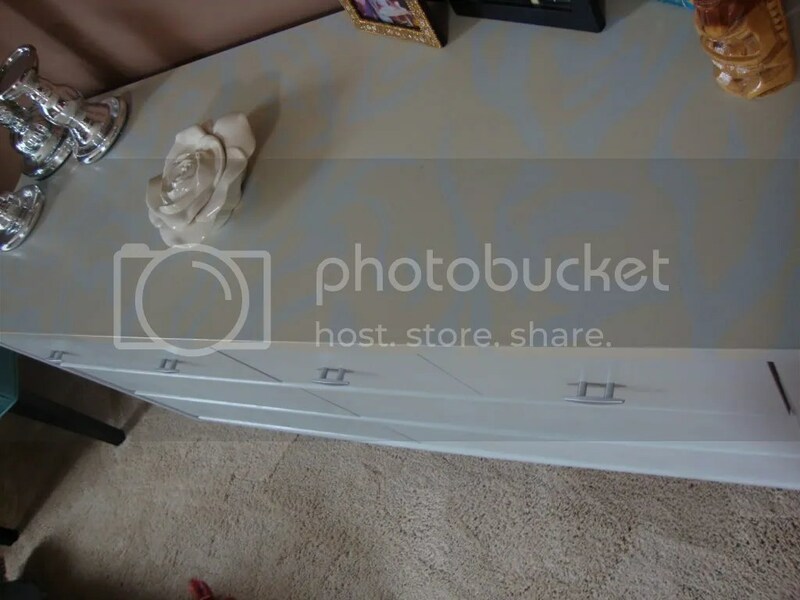 i have a dresser here at my house I may revamp! gotta fix the drawers and put on new hardware. What do you suggest for fixing the bottoms of drawers? I love what you did. It looks amazing! !